Radio La Vega 870 AM was heard both during LEM274 and LEM 290 in late January 2009 and 2010. 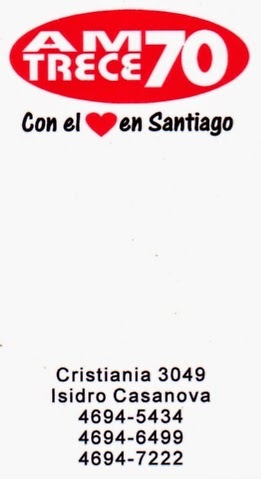 The stations transmitter site is located in the city of La Vega located almost mid-way between Santiago de Los Caballeros and Santo Domingo. Radio La Vega belongs to Medrano Group that also owns another DR-station logged in the Nordic countries namely R Olimpica, La Vega on 970. A couple of weeks ago I received a confirmation on my reception of R La Vega after a f/up. Jari Ruohomäki (JPR) made the first logging of R La Vega in Finland on November 11, 2007. The by far most common stations from the Caribbean Islands on 870 are R Reloj, Sancti Spiritus, Cuba and WQBS San Juan, Puerto Rico. This Argentinian is every now and then audible in the Nordic countries on 1370. The frequencies most common stations in the Nordic countries during southerly cx are Brazilian R Iguatemi, Sao Paulo and the URG-station R Ciudad de Montevideo. I have heard R Trece 70 a handful time during different LEM-peditions but it was not until recently I got a confirmation. Thanks Arnstein Bue (ABU) for your help! After a cx-vise mediocre 10 days in Lemmenjoki (LEM345) between October 16-25.2014 together with Pertti Äyräs (PÄ) now back home listening to clips from the evening of Oct 16 when some nice Aussies were heard. These are out-of scope of this blog. I yesterday surprisingly got a Facebook verification on an old follow-up from LEM258 (logged January 30.2008) to ZYH672 Rádio Vento Leste, Aracatí, CE. The station is nowadays known as Rádio Moría and as far as I know the station under it’s new name has not been reported heard in Finland. 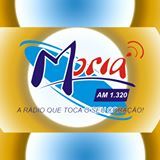 The probably most common Brasilian on 1320 nowadays is Rádio Regional, Sobral also in Ceará. CBN’s transmitter in Foz do Iguacu, Paraná on 1320 is heard every now and then but the dominating Brazilian stations on 1320 over the last yearshas been R Tropical, Curitiba PR and R Regional of Sobral, Ceará. Some days ago I received a confirmation of my report from February 2013. More than a dozen Brazilians still remain to be caught by Scandinavian DXers. The city Foz de Iguazu is one of Brazil’s most-frequented tourist destinations. Most tourists are Brazilians and Argentines, but Canadians, Americans, British, Germans, Italians, French, Portuguese, Spanish, Korean, Japanese and Chinese tourists are also numerous. The city has about 100 hotels and inns. The main attraction probably is the magnificent waterfalls Iguacazu Falls which is some three times bigger what comes to flow capacity than Niagara Fallas. Iguazu Falls is located at the border between Brazil (state of Paraná) and Argentina. This rare Brazilian was heard in late January 2009 during the LEM274 together with Pertti Äyräs. After many inquiries I finally recently got a surprising e-mail from Leandro Comunelho of Rádio Tupanci transmitting on AM 1250. As we know, 1250 offers a lot of opportunities for new loggings from Brazil here in the Scandinavian region. Interestingly enough, during the years only R Globo, Vitória and R Metropolitana, Vespasiano, MG can be said to have been regularily heard here. Since the frequency holds almost 20 stations there is a lot of opportunities for new catches. Unfortunately, though, many of the stations carry religious network programming during the night hours here up in the north making it extremely difficult to get a local ID. In the case of R Tupanci I had the luck to catch a perfect TOH-ID (4 minutes after the hour) including call sign, station name, frequency, power as well as Pelotas, Rio Grande do Sul”. As with stations from México, if one happens to hear an ID they usually contain so much information, beyond the station’s name, that the identification is quite easily made possible. Says Leandro Comunelho: “Nossa emissora fica na cidade de Pelotas, interior do estado do Rio Grande do Sul, a 260 kilometros da capital do estado, bem no sul do Brasil. Nossa programação tem como base o jornalismo informativo, futebol e musica. Na nossa grade de horarios temos programas de noticias (locais, estaduais, nacionais e internacionais), transmissão de jogos de futebol (aqui na cidade temos 3 clubes profissionais. Gremio Esportivo Brasil, Esporte Clube Pelotas e Gremio Atletico Farroupilha) e programas musicais (atendendo aos ouvites que solicitam musicas), também temos horarios de programação religiosa (foi o que o amigo ouviu quando da sintonia de nossa emissora)”. WHEW was surprisingly heard in October 2011 in Lemmenjoki on 1380 with a simple “La Raza 13-80 más música”. The station was also logged during the same period by at least Hannu Niilekselä, Tuomo Ahonen, Håkan Sundman and Jan Oscarsson (the latter in Parkalompolo, Sweden, I presume). Hannu Niilekselä provided the correct e-mail address to station owner Salvador Guzman who responded almost immediately and confirmed my included mp3 audio file. Salvador notes that “In November 01 2012 WHEW 1380 AM, changed radio station name. We are now WHEW BONITA 1380 AM, 1811 Carters Creek pike, Franklin Tennessee, USA 37064” and continues by proposing the establishment of THE LATINO 1380 AM NORTH POLE RECEPTORS CLUB among Scandinavian DX-ers catching WHEW. Thanks Salvador for a very nice communication! 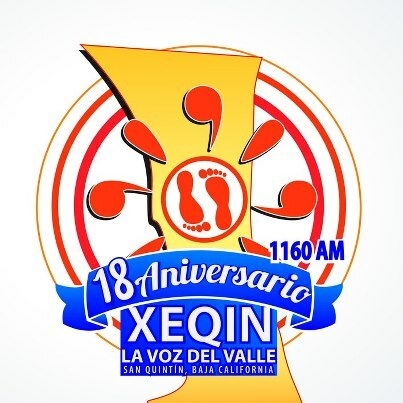 XEQIN La Voz del Valle in San Quintin, Baja California Norte on 1160 was a nice surprise when logged during the LEM274 pedition together with Pertti Äyräs in February 2009 around 13 UTC on 1160 without a sign of the frequency dominant KSL Salt Lake City. San Quintín is a coastal town on the west coast of the Mexican state of Baja California in the municipio of Ensenada som 300 km south of Tijuana. The confirmation I received yesterday is thanks to Håkan Sundman (HS) who provided me with a fresh email-address. Thanks Håkan.